This year Facebook split off the chat functionality from its main app into a separate Messenger app, which pretty soon became a mandatory download for those who use Facebook for chatting. Despite the bombardment of 1-star reviews from unhappy users, the Messenger app reached 500 million downloads in late August. Now, the social network has announced that the app gets 500 million users each month. The app has recovered its standing and currently sits at 4/5 stars with just over 11 million votes in the Play Store, though the Apple App Store still has it at 1.5 stars for the current version, 3-stars from a quarter of a million votes for all versions. Anyway, Facebook says it’s committed to improve Messenger’s reliability and speed and is shipping an update twice a month to keep the app in shape. 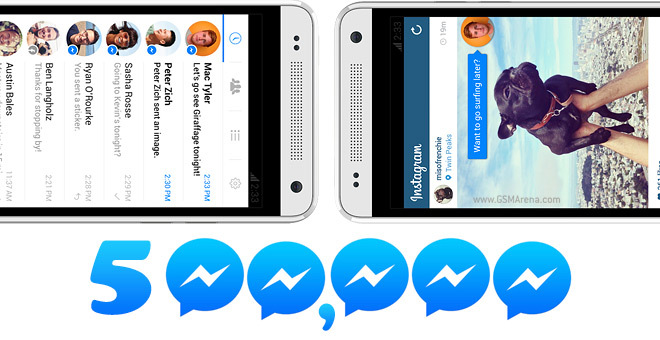 “This is an exciting milestone but with a half billion people relying on Messenger to communicate and connect, it is also a reminder that there is so much left for us to do,” says Facebook’s Director of Product Management, Peter Martinazzi. Indeed, Facebook hit 1 billion monthly active users two years ago so there’s plenty of its users who are not on Messenger. Facebook-owned WhatsApp hit 600 million monthly users earlier this year.